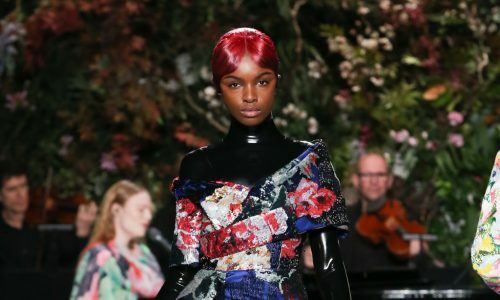 Under the intricately designed ceiling and chandelier of the impressive ballroom at the AMBA Charing Cross Hotel, the International Fashion Showcase played to a packed room including girl band Stooshe in the front row. The showcase featured a number of diverse designers brought together to celebrate and showcase their collections for autumn/winter 2016. The show started with Jireh Couture, showing a sophisticated and well-constructed collection featuring red peplum style zipped jackets in tweed, oversized and volumised at the neck. The collection featured painterly prints on silk jersey, which hugged the models seamlessly. Sparkling black fur stoles enveloped shoulders over textured, full-length wide skirts in gold and black lace. 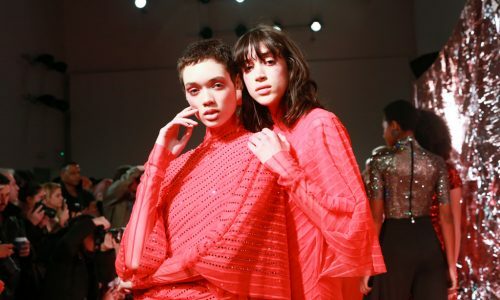 Coats were cinched in at the waist to perfectly accentuate the femininity within the pieces, and standout knitwear pieces presented in red with bell-shaped sleeves tied at the back with ribbons. The look was a combination of tweed Chanel-style dresses, with historic Balenciaga volume, and heralded a return to an 80’s silhouette with exaggerated shoulders adding power and drama to this beautifully formed collection. Next to show was label Cube Estonia, with amazing pillbox and beret style hats with jagged metallic tonal shards of acrylic cutting and jarring out of the felt. This aesthetic was cooler and edgier, with deconstructed white dresses, and slub-knit black and pink dresses, tees and knitted coats. Colours ranged from maroon and ice cold blue airline style dresses, with circular hem skirts and bathrobe boucle pink coats. Bright red belts added a touch of glamour to the look. Key looks were maroon leather draped shoulders on a full-length sleeve top, styled with high-waisted black wool skirts and marshmallow pink, good-enough-to-eat crepe cocoon coats. Interesting technical black acrylic fabric was used by Cube Estonia to shape and drape front and circular hemmed black skirts. Forever Devine earned rapturous cheers from the audience for their beautiful model take on Victoriana and Edwardiana, with high pleated white collars, on circular black silk knee-length hemmed dresses with cut-out backs and gold embellished front panels. The beading sparkled and the audience ooh-ed and ahh-ed in excitement at the peplum black silk tops, gold crystals zig-zagging down busts to add shaping on the fronts of translucent black silks. Colours were strong, in bottle green, red lace and tulip busts, and metallic gold crystals encrusting embroidery on black dresses. 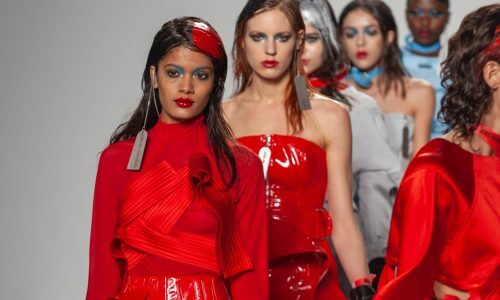 This was an extremely assured and highly wearable collection for Autumn/Winter 2016, with the crowd even bursting into spontaneous applause midway through. Sasmitha Dellawa showed a Georgian silhouette with an ode to Pride and Prejudice, rarely seen on catwalks. Colours were muted in cream, pastel lilac and the palest pinks featuring flashes of floral embroidery over structured coats, full-length dresses, in lace and netting. It was highly feminine and whimsical, until the eveningwear – which was body-skimming in length, with sensual black satin and chiffon lace, with netted dresses in duchess satin and draped shoulder detail, finishing with an ink blue netted 80’s style prom dress. AGA Couture also made use of black satin, though draped and pleated it with triangular and circular crystal beading at necks and waists, cut-out oval backs. An abundance of black lace featured on sheer black chiffon and netting, with incredibly low v-neck fronts, sequinned skirts, and off-the shoulder bands of black and gold sequins coating the models. Fabrics included sheer and velvet detail, with patterned sleeves – and knitwear was shown in highly pleated black dresses, with cuffed ¾ length balloon sleeves. The final outfit had innovative pin-tuck detail on the final outfit shoulders of a silk top, showing great craftsmanship. Sonali Malhotra was up next, with almost a hippy vibe shown in accessories – bold gold and turquoise Aztec style jewellery, and large crystal encrusted earrings combined to add to a Bollywood feel to the style. Pieces were typically styled off the shoulder, with one sleeve dresses in black crepe, triangular open detailing on sleeves, netted overlays in almost 90s style almost worn as armour. My favourite piece was a fabulous sari shown as the finale piece, in sinuous black chiffons and silks with crystals and circular silver beading. 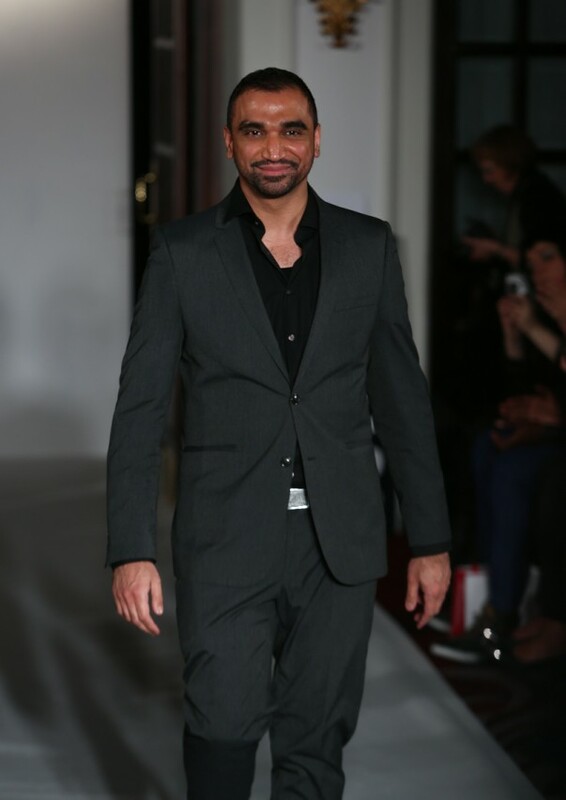 Lastly, designer and London Fashion Week regular Omar Mansoor showed his latest Autumn/Winter collection ‘L’Art Vivante’ – to a rapturous cheer from the audience. His inspiration came from Italian heiress and femme fatale Marchesa Casati, with models wearing gorgeous Venetian masks in black lace, feathers and metallic silvers to visually encapsulate the audacity and intrigue of Mansoor’s muse. Fabrics were hand-woven, in a principally charcoal grey palette. 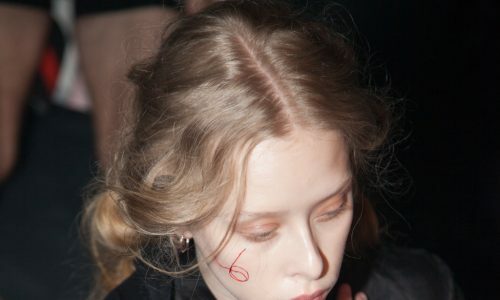 Encrusted circular draped dresses and coats, chiffon blouses in charcoal, wool grey skirts and trousers in pulled silk, contrasted against off-the-shoulder dresses, lowered waistlines, and velvet, almost mink coloured figure-hugging full-length dresses. 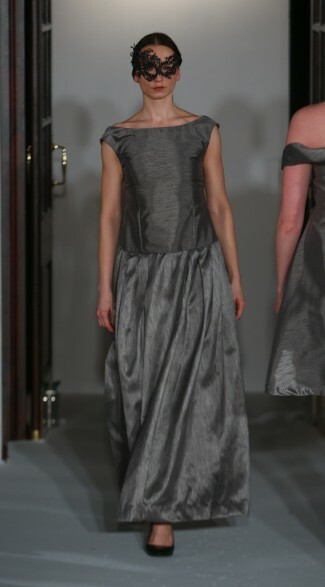 Metallic silver pleated silk Greek goddess dresses and grey leather liquid-fit trousers were rightly met by loud whoops of joy from the audience. 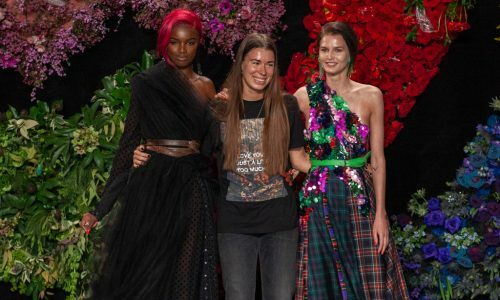 The Fashion International Showcase was a fantastic opportunity to bring such a wide-ranging variety of designers together. 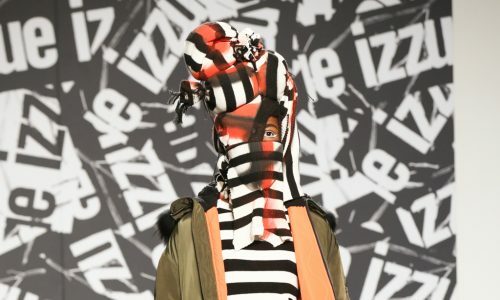 It provides an excellent platform to showcase such highly talented brands to a wider audience in such a beautiful setting and I am sure we will be hearing and seeing plenty more of the autumn/winter collections presented tonight.